As several times previously I have stated, what are exercises of endurance for one may be muscle-building work for another. Hence, experimenting must or should be done by the individual himself, to determine in what class certain exercises belong, so far as he is concerned individually. As endurance work places a heavy demand upon the lungs, and also as most forms of leg work tire the respiratory organs quicker than any other type of movements, it is necessary that special attention should be applied to all leg exercises. The common deep knee bending exercise consists of squatting down until practically sitting on the heels and then rising again until the legs are straight. This really is a movement of endurance, for, with a little practice, it can be done hundreds or times without stopping. In the beginning, however, to one who never before has fully bent his knees ten times, it quickly will cause fatigue; but rapid progress can be made in this exercise so that after a few months one, two or three hundred repetitions can be made before the student becomes winded or the muscles tired. This indicates the rapidity with which endurance will follow the determination and use of proper methods to acquire it. After you can perform one hundred and fifty or two hundred deep knee bends without stopping or becoming winded, you must have resistance to work against, or a bar-bell or someone sitting on your shoulders, to make this movement a muscle-building one. 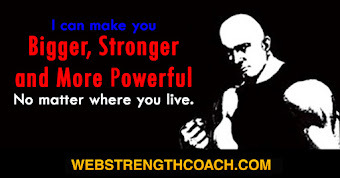 As your legs become stronger and your wind improves, the continued practice of deep knee bending or squatting with the same weight on your shoulders day after day will make this an endurance movement, for the legs will have become so muscular and strong and the wind will have become in such excellent condition that one hundred or more repetitions readily can be performed—unless the weight is increased as the legs become accustomed to the work. By the continual increasing of the weight or resistance the work becomes progressive, and naturally comes under the classification of muscle-building exercise. For the individual well along in years or the one with a weak heart, no progressive work should be indulged in, and the deep knee bending exercise, if done at all, should be performed very slowly, with a slight pause after each movement so as to give the heart, wind and thigh muscles a chance to recuperate. In this manner endurance movements can be performed, regardless of what the individual’s organic condition may be, except, of course, serious cases under medical care; and progress can be made in added repetitions rather than in progressive resistance. For instance, let us say that ten counts will be sufficient for the beginner who never has bent his knees in exercise. After three months he easily can perform one hundred repetitions; after six months, two hundred; and so on. Of course, such exercise would become very monotonous if no objective were in view; for this reason a limit should be drawn as to the amount of endurance work desired. If you intended to use your thighs and wind in mountain climbing, naturally it would be advantageous to you to be able to perform five hundred deep knee bends without stopping, as this would help you greatly in your proposed climb; you would find that the endurance you had acquired from the deep knee bending exercise would help you greatly in walking up seep grades, step over step. If you did not indulge in such exercise before attempting a long and laborious mountain climb you would experience fatigue before making much headway up the mountain. But if you did not contemplate performing such a pastime or any other strenuous indulgence that would be a test of your endurance powers, it would be absurd to attempt to work up to five hundred deep knee bends, for what would be the object? Without a definite objective I am sure that between one hundred and two hundred deep knee bends would give you sufficient endurance in the muscles of your thighs for all ordinary demands of daily life or emergencies. For the muscles of the knee, the ordinary rising on the toes is an exercise that can be continued for a great number of counts. If this work is to be made progressive, you must work against a strong resistance such as by elastic or spring exerciser, or hold a bar-bell, or a heavy weight at your side while performing this movement. But as the calves are used continually in every-day walking, they are naturally somewhat hardened against exercise so that they cannot be enlarged easily, and yet they are capable of great endurance. Even the average individual, unaccustomed to any form of physical activity, has muscles of the calves capable of propelling the body in walking for great distances. The size of the calves does not need to be given any consideration in respect to endurance. I have seen men with large muscular legs who tired very quickly in walking, and others whose legs had absolutely no muscular shape whatever who were capable of walking mile after mile without giving their legs a thought. As for preparing the muscles of the calves for endurance, I think that the best form of exercise would be heel-and-toe walking. In beginning this heel-and-toe walking you will find that the muscles of the shin play a more important part than do the muscles of the calves, as they will tire more quickly. Of course, the heel-and-toe walk is really muscle-building work for the beginner, but for the experienced walker it becomes an endurance exercise. It will be logical exercise, then, for strengthening the muscles of the shin in order to give the region below the knee greater endurance. If you sit down in a chair and lift your feet off the floor, point your toes downward and then bring them upward toward the knee as far as they will go, you will find a strain placed upon the muscles on the outside of each shin. By bending your ankles upward and downward in this manner you exercise these muscles. Roller skating and ice skating tire these muscles of the shin very quickly, as you have found out for yourself if you do any skating. If while sitting in a chair with your feet off the floor you are capable of raising and lowering your toes for a few hundred repetitions, you will give these muscles excellent work which will help you greatly in your endurance work performed with the legs. Deep knee bending, of course, brings into play these muscles to an appreciable extent. And while it is true that you are exercising chiefly the muscles of the thigh in performing the deep knee bend, nevertheless as the other muscles are brought into play the exercise is classified under group work; and muscles exercised in groups always have more power and coordination than muscles developed individually. The hips also come into action in practically all forms of leg work, and strong hips are to be desired. The finest exercise for the hips that I know of is to walk rapidly through the water when it is about knee deep. By plunging forward, taking as long steps as possible, you will find that you quickly will become fatigued in the hip region. Also, walk backward in the water as rapidly as possible. There are many who cannot do this exercise except when in bathing and many have no bathing facilities. These must indulge in other forms of hip movements. I suggest reclining work; that is, exercises performed while lying on the back, abdomen, and either side, and raising the legs upward from these positions. These exercises give direct exercise to the hip muscles. Walking up a steep grade or up flights of stairs also is an excellent movement for the hips, but such work borders on muscle-building exercise unless, through practice, you are able to walk up twenty or thirty flights of stairs without experiencing fatigue, or if you are able to walk up a steep grade for a quarter of a mile or more without becoming breathless, you can secure excellent endurance work for the hips by such exercise. The arms always have interested me. I have enjoyed beholding massive, knotty muscles, and it is my opinion and belief that the arm never can become too large in size. 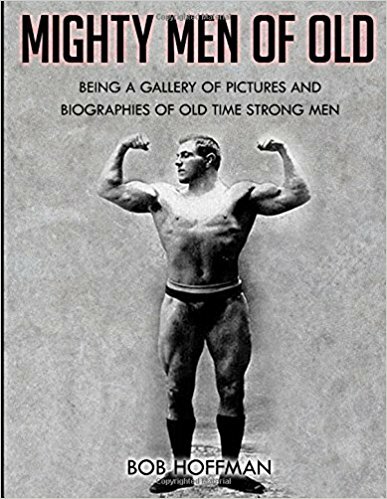 I have seen so many strong men with splendid necks, fine chest and backs, and well developed legs, whose arms spoiled the contour of their physiques owing to the fact that they lacked proportionate size. Every time you move your arms you use your chest, shoulder and back muscles, as well as, in certain movements, the muscles covering the abdomen. Because of this, it is my opinion that special attention should be given to the arms, so long as they move practically all other parts of the upper body. 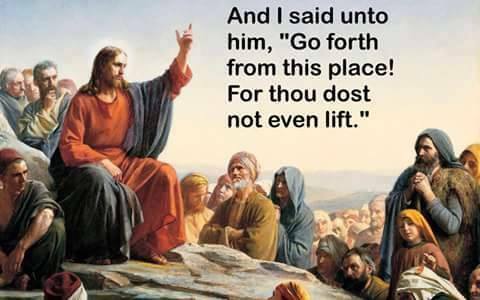 Do not misunderstand me, and think that you should neglect the shoulders, back and chest because of this statement. You should exercise the other muscles just the same, but you should give a little more thought to and put a little more effort into your upper arms. Strong arms are in demand and need many times; and their coordination with the shoulders, back and chest will prove invaluable in performing endurance work. One of the most valuable arm exercises of which I know and which will bring into play also the abdomen, chest, shoulders and back, is rope-climbing. To be able to climb hand over hand up a rope, time and time again, is really an endurance feat. 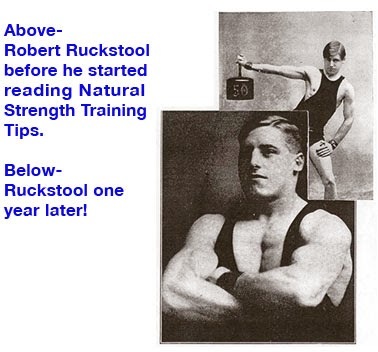 That it requires great strength is true; but as the repetitions can be performed many counts it should be classed as endurance work, just as lifting a fifty-pound dumb-bell overhead three or four hundred times should be classified as an exercise of endurance. To lift a fifty-pound dumb-bell once is strength work for the beginner, and to endeavor to climb the rope seems quite a stunt to the average individual; but it is something that should be mastered, for the coordination and endurance that you will acquire from this exercise may prove invaluable in saving your own life or that of another. The triceps muscle on the back of the arm can get sufficient work by the dipping exercise. This may be performed while lying flat on the floor and pushing up with the body rigid, or it can be performed between two chairs or parallel bars. In either case one can progress until able to perform the floor dip over one hundred counts and the dip between parallel bars over fifty counts without stopping because of fatigue. To obtain coordination between the muscles used in rope-climbing and those used in dipping between parallel bars, I suggest and strongly urge you to include a little horizontal bar work into your program. If you have no horizontal bar convenient, the same work can be done on the side of a fence, on a partition wall, or on any other object that you can reach from the ground. 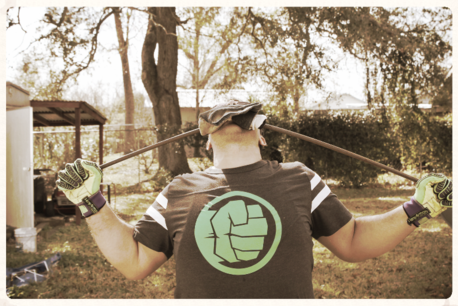 First pull yourself up until your chin looks over the bar, fence, or other support, then pull upward a little higher until you are able to place one elbow over the bar or fence. Then quickly place the other elbow over, and finally pull up until both arms are straight and you are resting entirely on your hands with the bar or fence rail at your hips. In other words, you should be able to climb over a fence or any object that is in your way in one continuous motion. This movement will give you coordination between your biceps and triceps and would be of great value should the occasion ever arise for you to save yourself by climbing. Actual rowing is an excellent exercise, also, for developing the biceps and triceps and coordination between these muscles. By the above it will be understood that I advocate outdoor exercises as well as indoor exercise for the obtaining of endurance. I know from my training experience that unless you actually perform open-air sports or pastimes calling for endurance you never will become proficient in them. You can exercise faithfully in your bedroom, perform the deep knee bending movement, many times daily, do calf and shin work and the hip work until the muscles ache, and yet if you were put to the test of running up-hill you would find your respiratory organs sadly lacking in endurance. For satisfactory results you should combine indoor exercises with actual endurance work out of doors. The same principal can be illustrated by swimming movements. After learning the motions of the crawl stroke, while you are lying in your bed or on a cot you can go through every motion with your arms, shoulders and even to the fluttering of your feet. Yet if you had had no actual experience in swimming you would lose the coordination learned in land swimming as soon as you hit the water. Of course, the knowledge of the movement would go a long way towards helping you to master actual swimming in a shorter time than without this knowledge. But even though you were able to swim and stayed out of the water for a year or more and simply performed the movements of swimming, you would not be able to swim such distances from such practice as you would if you did actual swimming daily. It is like learning boxing in the privacy of your own room. It reads good on paper, and as you shadow-box you knock out every imaginative opponent with whom you are boxing; but even with such knowledge, and experience, were you to put on the gloves with a fairly experienced boxer you would be found wanting. The only thing that you actually can do in the privacy of your own bedroom is to build up your body. 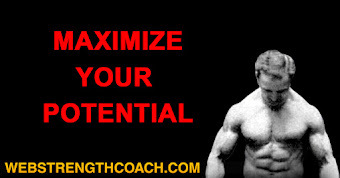 You cannot learn to excel in any sport and you cannot obtain endurance indoors. Such quality of movement must be done in actual practice. Competition is the greatest means of obtaining this practice and you would do well to indulge in as many forms of competitive exercise as possible. Let us suppose that you are a fairly good swimmer and that you can swim a quarter of a mile before experiencing fatigue. If you had someone who could swim a little better than you to swim with you for the same distance it would force you to make better time in the water. Perhaps the first time you might experience great discomfort at the completion of the quarter-mile swim; but after a while it would become easy, and a half-mile swim would interest you more than ever before. Rarely does anyone extend himself to his limit of speed or endurance without competition or self-preservation in view. If you should be in the habit of starting out alone to take cross-country runs, endeavoring to see how quickly you can make certain distances at a rather brisk trot, you would be surprised at the much better time in which you would make similar distances if someone were racing or even running with you. And you might smash all records if you were running for your life. It can be appreciated, then, that incentive plays an important part when it comes to extending ourselves. Just as it is quite difficult for an individual living alone to exercise day after day to build up his body, so it is difficult for an individual to adhere steadily to efforts to obtain or increase his endurance powers all by himself. Where two or more people exercise together, each one taking turns at performing movements and each one trying to outdo the other, rapid progress can be made in body building, just as track records are broken in competition which never would be broken if the runner or hurdler, or whatever he may be, were performing the work alone. 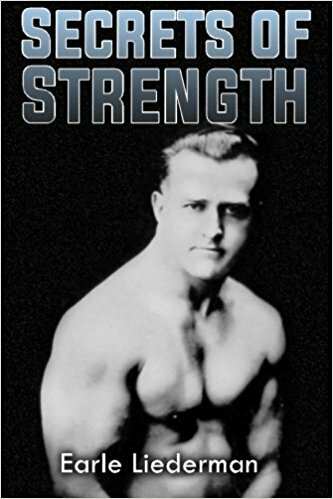 It is not the purpose of this book to give you a great variety of exercises for body-building or movements that you should follow to obtain endurance. 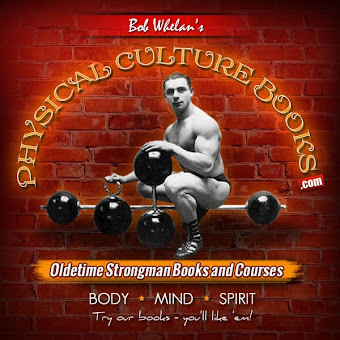 I have herein mentioned but a few of the best movement or exercises, merely as suggestions; but experience will teach you, through the practice you will undergo with your exercising, the best movement or series of movements for your case. 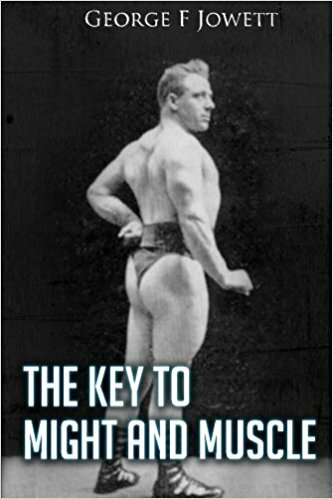 In another book, Muscle Building, I have gone more fully into anatomical conditions and specific exercises. I repeat that the main object of these pages on endurance is to awaken you fully to a realization of the value of the possession of coordination, strength and endurance sufficient to save your own life—or that of another, possibly someone more dear to you than your own life. However, I hope you will never be put to the test. Anyway, I hope the suggestions and advice contained in these pages will arouse enough enthusiasm within you to make your sports and pastimes more enjoyable.